A landing page is a stand-alone page on your website with the specific purpose of building your customer base. For a restaurant, a landing page can be very handy! It will allow your restaurant to collect contact information from your fans such as their name, email address, home address or phone number and you can utilize this information for marketing promotions. This may include specials, deals, coupons, contests and future promotions that your restaurant will send through email or by mail. Rewarding your customers with such promotions lets them know you appreciate their business and encourages them to come back. This is exactly what you want! We gathered several simple landing page ideas below for your restaurant marketing that will help you build more than one landing page for your website. Don't forget to watch Kulture Konnect's Q & A video above with a more in-depth interview about building your landing page. Our very own CEO & President, Jorge and Niki Pacheco share their extensive knowledge, tips and advice that will benefit your landing page. 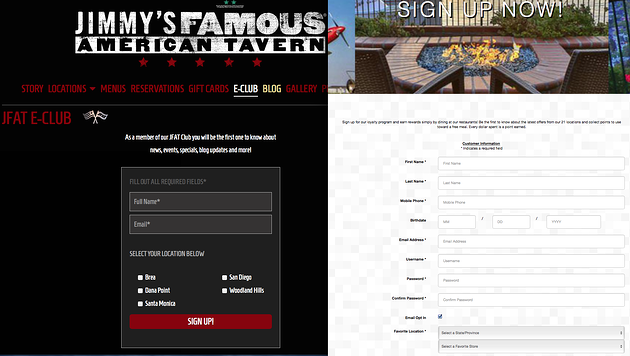 If your restaurant has more than one location it is a good idea to feature them separately on your reservations page. This will allow customers to have the option of choosing the location they would like to dine at. After the customer has made a choice, they will be redirected to your "make a reservation" page where they will enter their name, email, reservation date and time. There you have it. Done deal! Create an email club or loyalty program page where customers are rewarded with specials, coupons, deals or future promotions. Having an email club is another way to capture contact information used for marketing purposes. Your email club sign up form should always include name and email. It can be as simple as the Jimmy's Famous American Tavern example shown below or more detailed as the Orange Hill form to the right. Depending upon what type of information you are trying to get, you can always add more questions. It is a good idea to keep it short and simple. 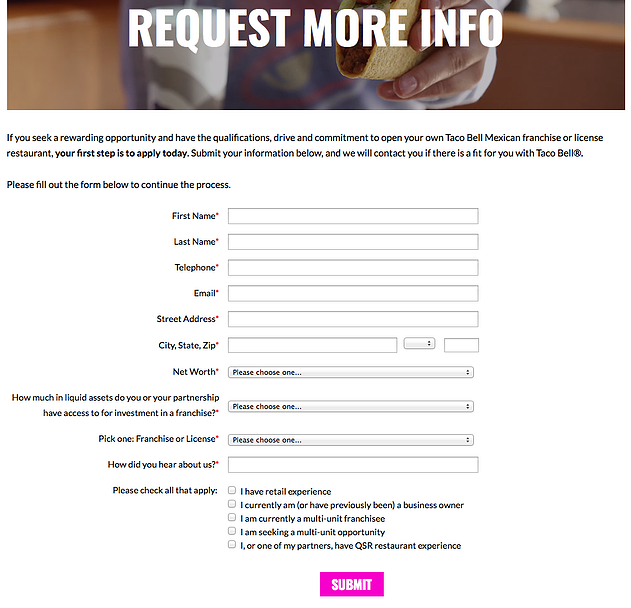 Bombarding customers with questions might discourage them from completing your sign-up form. Don't waste your time on unnecessary marketing! Several restaurants, including the Cheesecake Factory, have given customers the option to purchase gift cards through their website because it's very convenient for the buyer and it's a quick sale for the restaurant. As shown below, the Cheesecake Factory created a page specifically for purchasing gift cards with the option to mail or email the gift card straight to you. The form to the right includes filling out your email address as well as the recipient's email information. If customers choose to have it mailed, they will need to include their address along with their phone number. I suggest that you add a checkmark box at the bottom asking customers if they would like to receive promotional offers. Many restaurants such as Orange Hill and Fuzio, offer special events packages through their website. If you haven't done so already, your restaurant needs to get on this bandwagon. Not only are special events serious money makers, but also they are an opportunity to grab a client's information and follow up with them for their next special occassion. If your service was on point, there is a good chance your client will spread the word as well. This form should offer at least 5 to 7 questions to get a better understanding of the special event and your clients' needs. Don't go overboard! Keep the questions to a maximum of one page. The point is to seal the deal first with their contact information before asking more detailed questions regarding their special occassion. Quickservice restaurants such as Taco Bell are open to franchising and you might be too. Turning your restaurant into a franchise could be an excellent business move. Franchising allows you to expand your restaurant with the help of qualified individuals to run a new unit. This is an opportunity for you to get business contacts. Look at it as networking. You never know who you might meet. In this instance, you will need to ask important questions such as experience, background and financial questions on your landing page form such as the one below. Your restaurant landing page should be a maximum of one page. Avoid using a random landing page template. Make sure your landing page matches your brand. Use your brand colors, theme and logo. Lander offers a 14-day free trial and features a dynamic text replacement where you can match your PPC ad's keywords dynamically with your landing page content. Landingi offers a free trial with over 100 ready-to-use templates. With a modern database for collecting leads, it will allow you to manage your contacts and get to know your customers better. Instapage is said to have an average conversion rate above 25 percent and a testing tool that allows you to track visitor behavior and compare conversion rates. LeadPages allows you to choose a number of mobile-friendly templates for every industry. Each template is designed to increase your customer base, allowing users to join your email list, sign up for an event or buy your products. Unbounce allows you to customize your landing page and convert more by showing targeted overlays to specific users. In conclusion, your landing page can be a major help to your restaurant marketing. Once you have your landing page(s) up and running, you will be able to watch your contact list grow. As mentioned earlier, keep your landing page simple and straight to the point. Determine the objective or goal of your landing page as well as what you want to do with it and what you want your user to do with it. Seeking professionals for your restaurant marketing or website? Contact us here.